No. 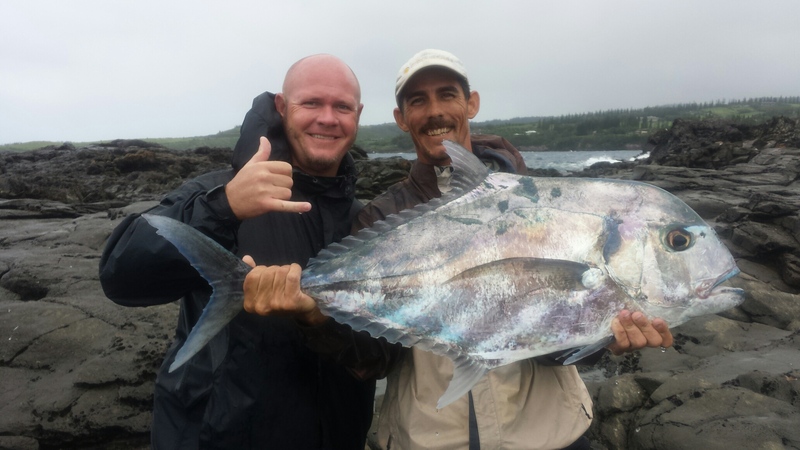 The state of Hawaii does not require a fishing license at this time. We encounter all kinds of weather and it can change quickly so please come prepared with a wind breaker, secure fitting hat, sunblock and a pair of polarized sunglasses. We will have a small cooler with ice to fit some food and a few beverages of your choice. We will provide bottled water, juice, and a light snack. *PLEASE do not bring bananas! Your guide can explain why during your tour. Included in your tour is round trip transportation from your hotel or condo to the fishing locations. Do you provide proper footwear? Proper footwear is probably the most crucial of all our equipment. Your safety is our top priority. Because we may be fishing from rocks we require that you wear non-slip sole shoes. We provide felt bottom shoes in full sizes. What will the fishing locations and terrain be like? We can fish from the beach and/or from the rocks. Some locations are a short walking distance from our vehicle. Others are a short hike down uneven terrain to the rocky shoreline. We can accommodate most levels of physical ability. What is the average catch? 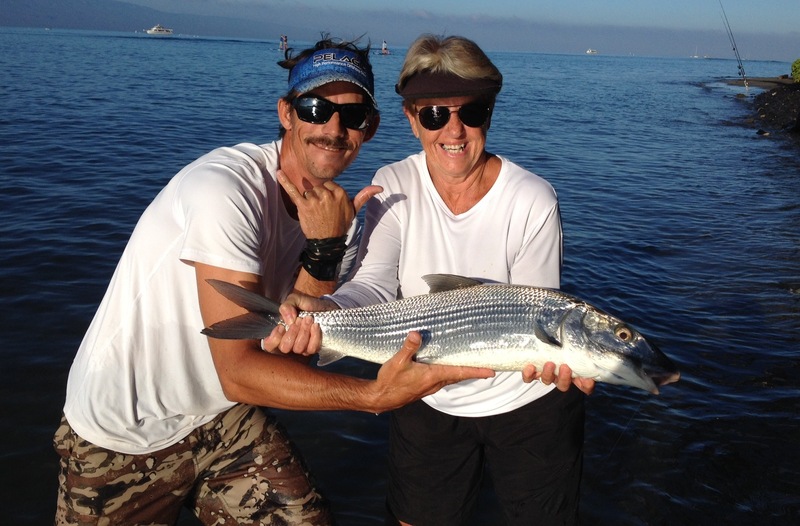 We catch plenty of small reef fish (8oz.-2lbs.) with bait. 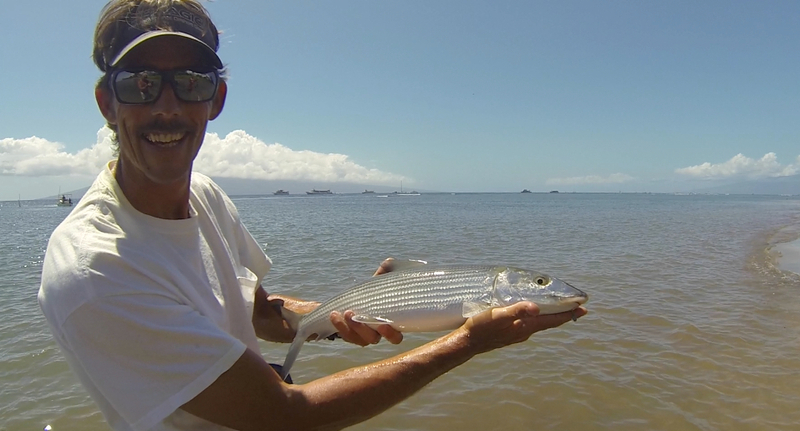 We’ll often use the small reef fish as bait for some of the bigger reef predators (3lbs.-30lbs.) such as popio, omilu, and ulua. Depending on the time of year, typically at first light. Do you offer afternoon trips? Yes for four hours only. Afternoon trips typically can be just as productive as the morning. We will fish the last few hours before sunset. We love kids! We can customize any of our three trips to accommodate you and a child age nine (9) and older. Can you take more than 2 anglers? We can accommodate up to 4 active anglers and/or people total. Depending on our location we may need to have 2 – 3 anglers switching off. 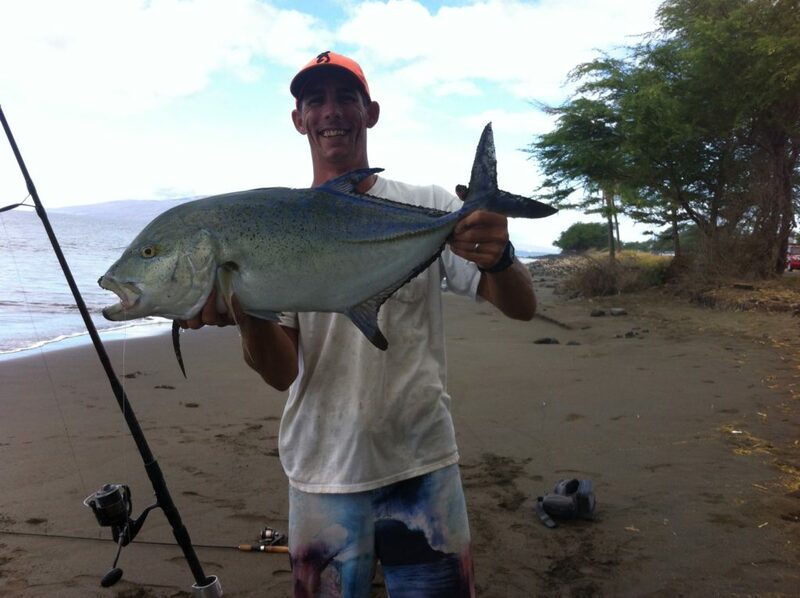 We charge $75 per person over and above the first two active anglers. However, we would not charge for anyone wishing to accompany you that will not be fishing.